New York, April 17 (IANS) US dollar increased as positive real estate data suggested a decent US economy. 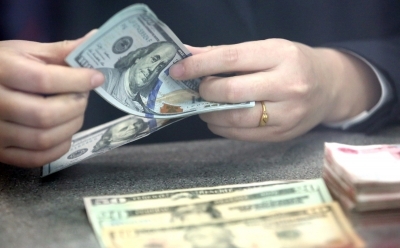 In late New York trading on Tuesday, the euro fell to $1.1287 from $1.1304 in the previous session, and the British pound decreased to $1.3052 from $1.3097 in the previous session, Xinhua news agency reported. The Australian dollar decreased to $0.7173 from $0.7174. The US dollar bought 111.99 Japanese yen, lower than 112.02 Japanese yen of the previous session. The US dollar rose to 1.0074 Swiss francs from 1.0042 Swiss francs, and it decreased to 1.3355 Canadian dollars from 1.3377 Canadian dollars. The Housing Market Index rose one point to 63 in April, up one point from March, the National Association of Home Builders (NAHB) said Tuesday, indicating higher builder optimism for the US housing market. The index is based on a monthly survey of NAHB members designed to take the pulse of the single-family housing market. Any reading over 50 signals improving conditions. The euro fell against the greenback on Tuesday, following a report that some European Central Bank policymakers thought the bank's economic projections for the region are too optimistic, causing concerns over the eurozone's growth. The dollar index, which measures the greenback against six major peers, increased 0.10 per cent at 97.0427 in late trading.